Mayweather, 38, stayed out of Pacquiao's vaunted left and landed enough punches to eke out a lopsided decision before a disappointed pro-Pacman crowd at the MGM Grand Garden Arena. By the final minute, Mayweather was already dancing around the ring and raising his hand, confident he had done enough to remain unbeaten in his 48th pro fight — just one short of Rocky Marciano's record. After the fight, it was disclosed that Pacquiao injured his right shoulder in training and that Nevada boxing commissioners denied a request for him to take an anti-inflammatory shot in his dressing room before the fight. Pacquiao chased Mayweather around the ring most of the fight. But he was never able to land a sustained volume of punches, as Mayweather worked his defensive wizardry once again. Two ringside judges scored the fight 116-112, while the third had it 118-110. The Associated Press had Mayweather ahead 115-113. "I take my hat off to Manny Pacquiao. I see now why he is at the pinnacle of boxing," Mayweather said. "I knew he was going to push me, win some rounds. I wasn't being hit with a lot of shots until I sit in a pocket and he landed a lot of shots." The richest fight in boxing history — a bout that made Mayweather at least $180 million — wasn't an artistic triumph for either fighter. Far from it, with long periods where both men fought cautiously, looking for an edge. Pacquiao threw far fewer punches than he normally does in a fight, with Mayweather actually credited with throwing more. That was largely because he didn't throw his right hand often. Promoter Bob Arum said Pacquiao injured his shoulder sometime after March 11. Arum said Pacquiao's camp thought he would be allowed the anti-inflammatory shot because he had gotten them during training and they had been approved by the US Anti-Doping Agency. But he said paperwork filed with the commission didn't check the injury box, and the five Nevada commissioners decided in Pacquiao's dressing room that he would not be allowed to take it. Still, Pacquiao thought he had won the bout, largely on the basis of a few left hands that seemed to shake Mayweather. "I thought I won the fight. He didn't do nothing except move outside," Pacquiao said. "I got him many times, I saw the punches." There were no knockdowns, and neither fighter seemed terribly hurt at any time. Pacquiao landed probably the biggest punch in the fight in the fourth round — a left hand that sent Mayweather into the ropes — but he wasn't able to consistently land against the elusive champion. The fight was a chess match, with Mayweather using his jab to keep Pacquiao away most of the fight. Pacquiao tried to force the action, but Mayweather was often out of his reach by the time he found his way inside. "He's a very awkward fighter, so I had to take my time and watch him close," Mayweather said. Mayweather fought confidently in the late rounds, winning the last two rounds on all three scorecards. In the final seconds of the fight he raised his right hand in victory and after the bell rang stood on the ropes, pounding his heart with his gloves. "You're tough," he said to Pacquiao, hugging him in the ring. It was vintage Mayweather, even if it didn't please the crowd of 16,507 that paid prices unheard of for a title fight. They cheered every time Pacquiao threw a punch, hoping against hope that he would land a big shot and become the first fighter to beat Mayweather. But a good percentage of what he threw never landed. Mayweather often came back with straight right hands, then moved away before Pacquiao could respond. "I thought we pulled it out," Pacquiao trainer Freddie Roach said. "I asked my man to throw more combinations between rounds. I thought he fought flat-footed too many times." Ringside punch stats showed Mayweather landing 148 punches of 435, while Pacquiao landed 81 of 429. The volume of punches for Pacquiao was a lot lower than the 700 or more he usually throws in a fight as he tried to measure his aggression against an opponent who was hard to trap. Five years in the making, the richest fight ever unfolded before a glittering crowd of celebrities, high rollers and people who had enough money to pay for ringside seats going for $40,000 and up. Before it did, though, it was delayed about a half hour because cable and satellite systems were having trouble keeping up with the pay-per-view demand. They paid big money to watch two superstars fight for their legacies — and in Pacquiao's case his country — in addition to the staggering paydays for both. 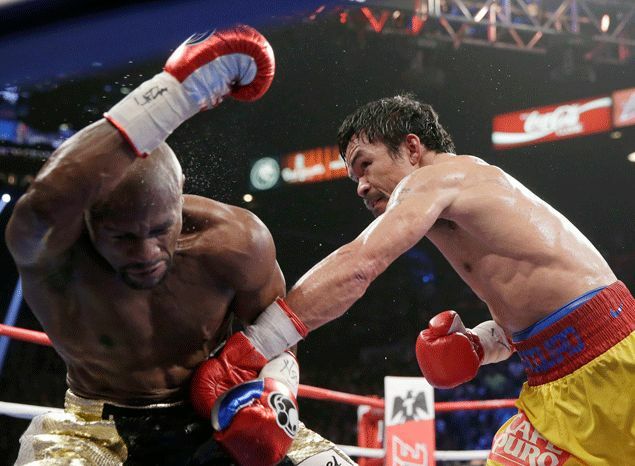 Pacquiao had vowed to take the fight to Mayweather and force him into a war. His camp thought Mayweather's 38-year-old legs weren't what they once were, and that he couldn't be on the move the entire fight. "He is moving around, not easy to throw punches when people moving around," Pacquiao said. " When he stayed, I threw a lot of punches. That's a fight." But Mayweather proved them wrong, moving well and taking pot shots at Pacquiao. His only real moment of trouble came in the fourth round when Pacquiao landed his left hand and then flurried to Mayweather's head on the ropes, but he escaped and shook his head at Pacquiao as if to say you didn't hurt me. In the corner between rounds, Mayweather's father, Floyd Sr. kept yelling at his son to do more. But Mayweather was content to stick with what was working and not take a risk that could cost him the fight. "I'm a calculated fighter, he is a tough competitor," Mayweather said. "My dad wanted me to do more but Pacquiao is an awkward fighter." Mayweather said that his fight in September against a yet-to-be-determined opponent would be his last. "I'm almost 40 years old now. I've been in the sport 19 years and have been a champion for 18 years. I'm truly blessed." Mayweather is also very rich, getting 60 percent of the $300 million purse, depending on pay-per-view sales. The live gate alone was more than $70 million, and the bout was expected to easily smash the pay-per-view record of 2.48 million buys set in 2007 when Mayweather fought Oscar De La Hoya. But while the frenzy over the fight pushed up tickets to 3-4 times their retail price the week of the fight, prices dropped dramatically as the fight neared and some tickets were being resold for less than face value. Boxing fans called for the fight to be made five years ago, when both men were in their undisputed prime. But squabbles over promoters, drug testing and a variety of other issues sidelined it until Pacquiao beat Chris Algieri in November and immediately launched a campaign to get the fight made.